Lisburn College of Further Education. Drawing by Judy Cinnamond, 1990. 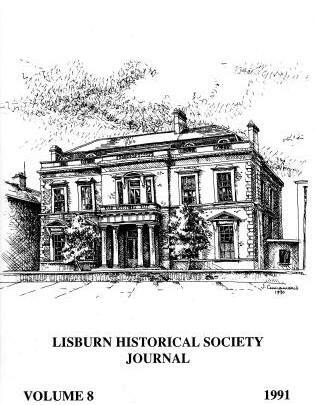 I am delighted to introduce volume 8 of the Lisburn Historical Society's journal. Since our first publication, a decade ago, the journal has gone from strength to strength, for which we are much indebted to our Editor, Eileen Black, of the Ulster Museum. For this volume, she has brought together a number of distinguished contributors, each a recognised authority in their chosen field. Dr. Raymond Gillespie discusses Lisburn in the time of George Rawdon, Richard Warner continues his work on the Lisburn area in the early Christian period and William Kerr, that indefatigable local historian, analyses inconsiderable detail the burial registers of the parish of Derriaghy, in order to establish the principal causes of death during the nineteenth century. Dr. Christine Kinealy provides a valuable insight into the effects of the Famine in the Lisburn area, Trevor Neill, former Chairman of the society and a fount of knowledge on Lisburn, contributes an interesting piece on the Earl of Hillsborough's wedding celebrations at Hillsborough in 1837, while our Editor continues her series of articles on the Drumbeg area, upon which she has written so eloquently in previous volumes. Sincere thanks to all of these. Our thanks are also due to Brian Mackey, who has provided details of recent acquisitions in Lisburn Museum, to Judy Cinnamond, who executed the cover illustration with her usual skill and efficiency and to Brenda Collins, for kindly supplying details of her local history project on Aghalee. In these days of spiralling costs, what is essentially an amateur production needs to maximise sales as quickly as possible. We therefore hope that readers will support us by buying not just one copy of this publication but also copies for their friends. The society has had an interesting year, both in winter lectures and summer outings. As 1989 was the 150th anniversary of the Belfast to Lisburn railway, the year started appropriately with stalk by Charles Friel from the Railway Preservation Society. Dr .W .D. Baillie gave an interesting talk on the early nineteenth century bishop, Dr. Richard Mant and the part he played in the rise of Puseyism, Jack Magee, a former president of the Linen Hall Library, lectured on the radical Belfast society in which the Library had its foundation and Colonel Robin Charley spoke on the tercentenary of the Royal Irish Rifles. Ernest Cromie, who has cornered the local scene in aviation history, gave a fascinating lecture on the role played by Northern Ireland in the Second World War. Lastly, and for one listener, the most memorable, we had a magical evening in Lisburn Museum with Janet Harbison and her harp. As in previous years, the unflappable Finney O'Sullivan organised a series of outings with his usual quiet efficiency. The Boyne Valley was once again visited, with special stops al Beaulieu and Trim. Archaeology Day in May was celebrated with a trip to Navan Fort, now thought to be one of the most important pre-historic sites in Ireland. Our guide on the occasion was our old friend Roger Weatherup of Armagh Museum. Eull Dunlop, of the mid-Antrim Historical Group, was our guide to historic buildings in the Ballymena district. Members of the society assisted in the research for the Williamite exhibition in Lisburn Museum and also with the exhibition on the centenary of the death of Sir Richard Wallace. Finally, we record with regret the passing of Miss D. McPike, a long-standing member of the society. I should like to express my sincere thanks to all those involved with the production of this journal. Firstly, of course, I am grateful to the authors-all busy people-for producing interesting and worthwhile material for inclusion here. Secondly, thanks to those of the committee who are involved in the financial side of this magazine. Their work, not heralded in articles, is also of value and important to the process of publication. Hopefully this volume will be as well received as former issues and the contents found as interesting.